Please come out in support of Horner Park. 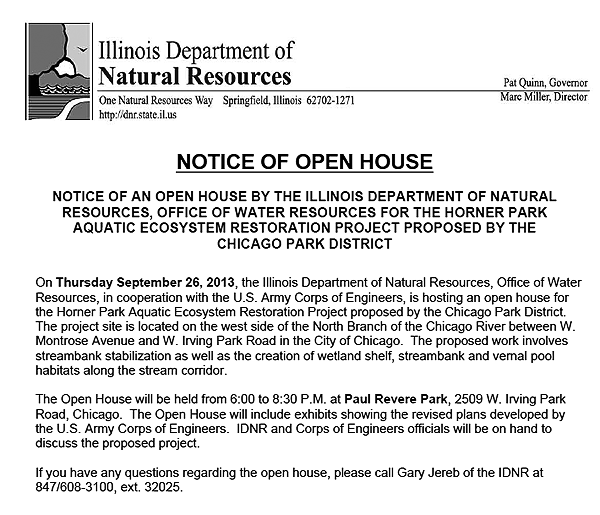 On Thursday September 26, 2013, the Illinois Department of Natural Resources, Office of Water Resources, in cooperation with the U.S. Army Corps of Engineers, is hosting an open house for the Horner Park Aquatic Ecosystem Restoration Project proposed by the Chicago Park District. The project site is located on the west side of the North Branch of the Chicago River between W. Montrose Avenue and W. Irving Park Road in the City of Chicago. The proposed work involves streambank stabilization as well as the creation of wetland shelf, streambank and vernal pool habitats along the stream corridor. The Open House will be held from 6:00 to 8:30 P.M. at Paul Revere Park, 2509 W. Irving Park Road, Chicago. The Open House will include exhibits showing the revised plans developed by the U.S. Army Corps of Engineers. IDNR and Corps of Engineers officials will be on hand to discuss the proposed project. If you have any questions regarding the open house, please call Gary Jereb of the IDNR at 847/608-3100, ext. 32025.